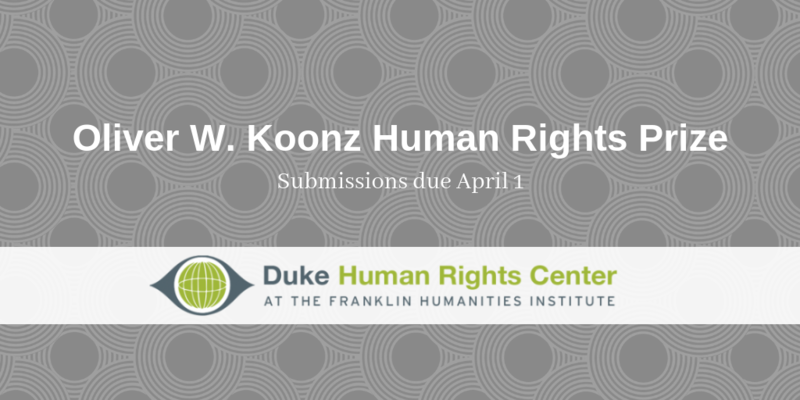 Duke undergraduates are invited to enter essays or alternative projects regarding global human rights issues in the annual Oliver W. Koonz Human Rights Prize competition. The Duke Human Rights Center awards one $500 prize in each category of best essay and best alternative project on a human rights theme. The Oliver W. Koonz Human Rights Prize honors Oliver W. Koonz (1910-2009), who was the father of Claudia Koonz, the Peabody Family Professor Emeritus in the History Department and a founding member of the Duke Human Rights Center at the Franklin Humanities Institute. Professor Koonz is a passionate advocate of undergraduate education. She has taught and mentored hundreds of Duke students during her career at the university. Her areas of specialty include genocide, 20th-century European history, and fascism. From her father, she inherited a passion for the outdoors and learning. This prize honors his memory. Essays must be no longer than 25 double-spaced pages. They may take the form of analytic or critical essays, empirical research papers, term papers, or personal essays on any human rights issue. Projects can be photo- or video-based, theater pieces, scripts, or web pages. Please send submissions with an introductory paragraph describing the connection with human rights and specifying if the paper or project is related to a course. Submissions do not have to be created in the context of a course, but must be done during the time the student is enrolled at Duke. Please send submissions to Emily.Stewart@duke.edu by April 1, 2019. Awards will be announced in May 2019.